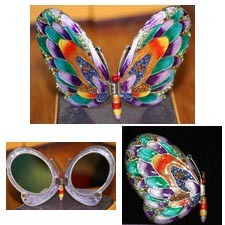 Pewter Enamelled Butterfly compact mirror by Rucinni. 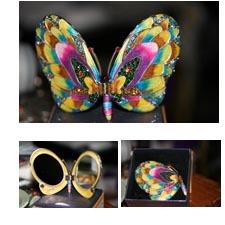 Embellished with Austrian Swarovski Crystals. 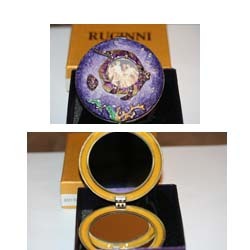 Pewter Enamelled foldover compact mirror by Rucinni. 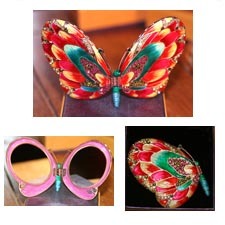 Embellished with butterfly & flowers and Austrian Swarovski Crystals. 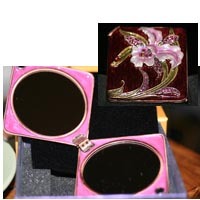 Pewter Enamelled Red Orchid compact mirror by Rucinni. Embellished with Austrian Swarovski Crystals. 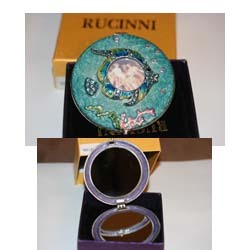 Pewter Enamelled Purple Fish compact mirror by Rucinni. Embellished with Austrian Swarovski Crystals. The Fish is removable magnetized picture frame. 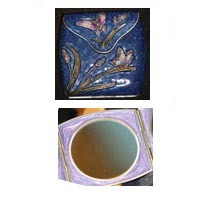 Pewter Enameled Teal Fish compact mirror by Rucinni. Embellished with Austrian Swarovski Crystals. The fish is a magnetized picture frame. 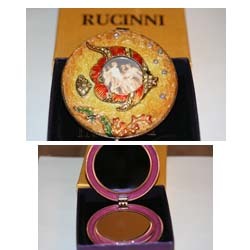 Pewter Enamelled yellow fish compact mirror by Rucinni. Embellished with Austrian Swarovski Crystals. The fish is a magnetized picture frame.